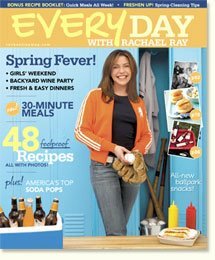 "Everyday with Rachael Ray, a monthly magazine by The Food Network's hottest host, is as effervescent in its design and tone as its eponymous star. Rachael's recipes are the publication's main entrÃ©e, but they come served with a large side order of lifestyle features, including product guides and travel stories. Our favorite: Rachael peeks inside the fridges of celebrities to see what they like to snack on."